Army Sgt. Tyler Ray Curtis, 25, of Jay, Maine; assigned the Bravo Company, 1st Battalion, 41st Infantry Regiment,2nd Brigade Combat Team. Tyler died on November 22, while at home after serving this great country overseas. Tyler was born in Farmington, a son of Gary M. and Joyce A. (Doiron) Curtis. He recieved his education in Jay schools where he was a respected member of the Jay Tigers Football Team. He graduated in 2001 and followed his lifelong ambition of joining the United States Army. 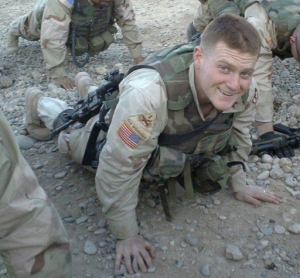 He was honorably discharged in 2006, and continued his education at Wyotech trade school in Blairsville, Penn., graduating in August of 2007, as a diesel mechanic. He currently was employed at Kris-Way Trucking in Auburn. He was an outdoorsman who enjoyed hunting and fishing and spent many happy times at the Curtis Camp in East Dixfield. He was a humorous, mischievous, outgoing, well-liked person and enjoyed being the center of attention. He enjoyed spending quality time with children and was a mentor to his nieces and nephews. Tyler’s mom Joyce selected the special stone from an area that Tyler loved to spend his free time. 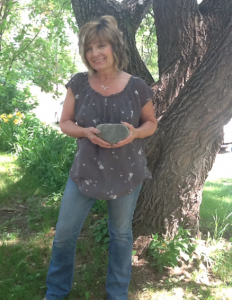 Joyce said she knew right where she needed to look for the stone and when she arrived at “Camp Curtis” it did not take long to find it. The stone resembles a heart and that made it all the more special for Joyce. Tyler’s favorite place on earth was Camp Curtis and after serving his tours he would come home and find peace in the spot he knew would provide it. Joyce said Tyler had many passions but most of them focused around his family. His nieces and nephews always held a special place in his heart. He would often play jokes and always had something up his sleeve to make them laugh. He also found comfort in animals. Joyce remembered all the times he would be out of the house and would always have her dog by his side. Something about the dog seemed to calm him and she knew they shared a special bond. One of his favorite sports was football. He played with an intensity that was unmatched by others. The brotherhood that existed within the team along with his drive to be on top of his game brought him back to the field time and time again. He also found an interest in being a mechanic and was skilled enough to be a diesel mechanic while in the army. He had a tremendous ability in working with his hands and was a valuable asset within his unit. Although a great kid, brother and friend, Joyce laughed when she mentioned how Tyler was always up to something mischievous. She remembered a time when he was playing basketball in the small town that he grew up. While waiting for his game to start he and a friend made their way out to the lobby and in a moment of curiosity pulled the fire alarm. When the fire department showed up he was no where to be found which made him more guilty then he realized. As Joyce started to tell the above story I began to laugh. I remember that day well. I was there playing ball with the rest of the kids. Part of my interest in The Summit Project was to bring Tyler and his story into TSP. I grew up with Tyler and was best friends with his brother Ryan. A good part of my childhood life was spent with Tyler’s family. There were times where I thought I might as well be the fifth Curtis kid. Brett, Gretchen, Ryan and Tyler….why not one more? I remember Tyler as a funny kid. As a kid who, like Joyce said, was always up to something. If he wasn’t chasing Ryan and I around the house we were all playing in the woods. Whether playing in the stream that ran near the house or playing “army” all dressed in camouflage and armed with our toy guns, we were kids just having fun. Just like every other kid our age. What I now know about Tyler is that he never outgrew that army phase. Joyce told me he always wanted to serve his country. She remembered him saying he was going to join the Army and Joyce would always tell him otherwise. She was scared for her son and rightfully so. She remembered when Tyler was getting closer to graduation and the recruiters would come to the house. Joyce would refuse to talk with them and even deny access into her home. Tyler knew what he wanted to do and he made it happen, even if his mother was against it. Joyce was proud of Tyler. She was proud of his accomplishments and the service he provided to his country. While proud, she also feared for her sons safety and after two tours overseas Tyler came back home and was a changed man. He struggled to fit back in with civilian life and tried hard to beat what he couldn’t hide from. Tragically, Tyler took his own life because he thought he had no other options left. Joyce said they tried for a few years to get him help but nothing seemed to work. Tyler took his life on Thanksgiving morning, as a result of post-traumatic stress syndrome, having served his country proudly and honorably, surviving two tours of duty in Iraq. Thanks for your service to this amazing country. This touched my heart,feel like part of family.I’m just an ole Viet Nam Vet.I new this family.Brett and Gretchen was at Dixfield High with my children.God bless.I thank Tyler for his service.Boy! Tears here. Dear Joyce, this is my first time learning about Tyler as a young person, full of life and love. What a wonderful article about the both of you! Tyler’s death was so tragic for your family, (which is now my family too), that I have only been told of your loss, not about his childhood and outgoing personality. Sadly, it is still difficult for some to talk about his story. It is so very painful for you all. I have always admired your courage and dedication to your children. You are a remarkable woman and raised a remarkable son ( in addition to your other kids, of course!). I am so glad to see this and to learn more about Tyler and about you. It only adds to my respect for each of you. He got his bravery from his Mom. Love and blessings to you. I am sorry for your loss . I had the honor of carrying Tyler’s stone and story on TSP at ANP this year. This was the first hike that Tyler’s stone was carried and it is a climb that I will never forget. The night before the climb I found it almost impossible to sleep. My mind was filling with different thoughts of what the next morning would bring, how I was going to feel climbing Cadillac Mountain with Tyler’s stone. Thankfully the morning started off with a beautiful sunrise and meeting some amazing people. The climb was something that I was ready for physically but emotionally was a different story. I had four hours to climb and think about what Tyler and his family had gone through and it put a lot into perspective for me and my life. It showed me that sometimes I take for granted what is most important to me. My family is everything to me and keep me grounded. I’m not sure what I would do if I didn’t have them in my life. This brings Tyler’s death into a real perspective for me. He fought so hard for this country. He literally gave everything for the greater good. When he came home his family joined him in his fight. Tyler struggled with PTSD but his family was right there with him. He and his brother became much closer and the whole family circled around Tyler to let him know that he wasn’t alone. When we reached the summit the team all gathered to share the stories of the heroes we climbed in memory of. As I listened to the lives that all the fallen heroes had lead both on the battlefield and here at home the common link to every one of them other than their service was the love for their families. As I told Tylers story I made sure to mention about his family and how hard they fought to keep him healthy. Family is always worth fighting for. I believe in some way that Tyler has made me a better person. His fighting spirit will always be with me. His family means a lot to me and they will forever be in my families thoughts and prayers. Just today my daughter came home from school and said that her class was talking about veterans and how important they are to our country. Maddy said she thought about Tyler and his story. That made me very happy to know that for another generation Tyler will be remembered. ..and on behalf of myself and my grandaughter, Randi Lynn..thanx for your service to our country, rest easy, T…..w/our love. Joyce, I know what it is like to lose a child, a piece of your heart is gone…….but I know that they are in a better place for them, they are at piece now. You have to be so proud of your son, he fulfilled his dream and did it well. I thank him for his service. Joan, I’m sorry for your loss as well. I remember Nicky as a beautiful, smart, funny girl who always had a smile on her face. She was so sweet. She left you two great grandchildren. I don’t know Vincent that well, but Grace has Nicky’s smile and her sweet personality. I know they are finally happy and at peace. My name is Grady A. Thurlow and I had the privilege to carry Tyler’s Story and stone during this year’s TSP BSP16. Because we had one of our hikers not able to do the hike, I stepped forward on Friday to carry Tyler stone, as the saying is “No Soldier is left behind”. I started looking into Tyler’s story by reading his Bio. Tyler was a hard working person and had a love for his country. Saturday morning as I was riding in my truck toward Katahdin I was overwhelmed with a sense that the guys were with me in spirit. As I drove along I seem to connect with them, the love they had for their families, some of the struggles they went through, fears faced while deployed, I promised that their memories will not be forgotten. I had a peace come over me that they approved of this great Event Maine Heroes Are Never Forgotten. When the Patriot Riders arrived with all the stones, it just enforced my belief in this great Mission to Honor our Fallen and their Families. I prepared for my hike on Sunday Morning by packing my gear and the stones of Tyler and Thomas. I remembered how Tyler loved the outdoors and to go to Camp Curtis in Dixfield. I also thought of how he loved to be around his Family, and how I was about to hike with 10 other individuals that I did not really know, but we all had a common theme to honor our hero. As we hiked, I got to know my team, where they worked, what they like to do, their families, the stories of the other fallen heroes in our group. It all came down to we were drawn together by a common thread and because of this we have grown The Summit Project Family in a way that I hope we support our Gold Star Families in the years to come. Once back at base camp we turned our stones back to our TSP family, but I will always carry Tyler’s Story in my heart. May you have some peace knowing that Tyler’s memory will live on through this great Project. You are a great man for carrying Tyler’s stone with you. Tyler too was a great man and I know he was with you. Thanks my friend. I did not know Tyler. I lost my son in Afghanistan 2012. Thank you for remembering , telling their stories, saying their names. Parents live in the fear their Fallen will be forgotten. This project lets us know our loved ones are not forgotten. Tyler was a good friends, I am glad to see him continue on in the spirit and kindness of others. Thank you very much for sharing. I had the honor and privilege of carrying the stone of Army SGT Tyler Ray Curtis up the North Ridge Trail on Cadillac Mountain. I was on team KEBO—each person carrying the weight and story of a fellow fallen soldier. A Spirit and Family stone accompanied us as well, which to me felt like the backbone of our hike and The Summit Project. Since my first hike at ANP 2015, I instantly felt a sense of community and connections made with fellow hikers—volunteers and gold star families created a feeling of family and unity that our Country so desperately needs more of. This Hike was a bit different and really hit hard at times, as two of the hikers carried stones of their loved ones. A wife carrying her husband’s stone and a sister carrying her brothers stone. Seeing others extend a hand to hold, a shoulder to lean on and an embrace for comfort, being there with and for each other every step of the way, to me, is the best way to define family. In the weeks and months before the hike I spent a lot of time researching and learning about Tyler, who he was pre war and post war. How he loved being and Uncle and being an outdoorsman, how he liked mischief and football, and how he always wanted to be in the army. I wanted to learn more about Tyler, I wanted to go deeper, I had questions I didn’t dare ask but hoped too if the time was ever right. Everyone tends to tread lightly due to respect when it comes to death by suicide. I struggled with the desire to know how and why and when the signs and symptoms of posttraumatic stress became more and more concerning. Knowing Tyler served two tours overseas I wanted to know more about the emotional effects of war. As fate would have it, I ended up sharing a cabin with two of my last year’s blackwood teammates. Chris Wytock grew up with Tyler and was good friends with Tyler’s brother and practically a member of the Curtis family. As Chris and I sat around the campfire we talked candidly about PTSD, a war disorder in which traumas extend beyond the battlefield, and how it affected Tyler. I left that conversation with a deeper understanding of what casuality of war means. Suicide is a real issue. One that does not have to be hidden or left out of a conversation because of a stigma that society has placed upon it. I truly believe that together we can make a difference one life at a time. Tyler Ray Curtis has a story and it needs to be heard and talked about, Tyler can make a difference in the lives of many soldiers struggling today. I would encourage everyone I know to learn more about suicide prevention and awareness. And Identifying signs of crisis. Tyler’s life does not need to be defined by the way he left the world. So today and always when I think of Tyler I will see his mischievous smile and feel his love for his county and his family. May you rest in peace Tyler Ray Curtis, you will never be forgotten. On Sunday May 28th, 2017 I had the distinct honor and privilege of carrying Tyler’s stone with me on a spirit hike on the Twin Pines campground as part of the TSP at Baxter State Park 2017 event. On Sunday morning when I woke up, I did not plan to hike at all as I was planning to solely support as a Base Camp volunteer. When I awoke on Sunday morning, I did not know Tyler, but he is a man I will never forget. His story lives on within me from now on. When the opportunity arose for me to join the Gold Star families and other Base Camp volunteers on the spirit hike, I was eager to participate. Previously I had hiked at Acadia National Park in October 2016 and felt a bit uncomfortable with returning to a TSP event without a fallen hero’s stone as part of my experience. I embraced my Base Camp volunteering duties, but jumped quickly on the opportunity to carry a stone on a brief hike around the campgrounds. Again, destiny led me to Tyler as I asked Angel Matson to pick a stone for me. I have found that it is best for me to let the stone choose me. I am grateful that Tyler’s stone was lovingly passed from Angel’s hands to mine. Although I never met Tyler, it was an honor to get to know his story and share it with others. Throughout the hike and the rest of the weekend, my heart ached for Tyler’s family. I thought of their pain as I surrounded myself with other Gold Star family members. I wondered what they were doing on this Memorial Day weekend and how they were reflecting on Tyler’s life of service and sacrifice. I felt a sense of unspoken connection with those who loved Tyler as I carried the weight of his stone. As I shared in the Circle Ceremony, I thought about what Tyler taught me about character. Tyler dedicated many years of his life to service. Tyler made countless personal sacrifices to serve his country in Iraq for two tours. Tyler put his country and his fellow Americans before his own needs and wants as a very young man. Tyler understood that the choice he made to leave his family and all that he knew in Maine to risk his life was the right one for him because of his sense of duty and fierce courage. He lived his life by putting others before himself. For this, he paid the ultimate price. Tyler’s invisible wounds of war led him to take his own life on Thanksgiving morning of 2007. Each Thanksgiving, I will now take a moment to think of Tyler and his family with the deepest sense of gratitude and respect. Thank you for sharing the story of this amazing man with us. Maine heroes are not forgotten. Tyler’s story and legacy lives on in all of us. I, once again, had the honor and privilege to carry the stone and story of Army SGT Tyler Curtis to the top of Cadillac Mountain for TSP ANP 2017. When the group was asked to submit any requests for stones for the annual hike, I felt like it was time to hike with Tyler again, and the request was granted. I always feel like I owe it to his family to tell his story whenever I can, to be in the true spirit of TSP, Maine Heros Are Never Forgotten. The hike up the mountain always brings with it a level of nervousness and unsettled feelings. While I always find it calming and pieceful to be in the woods and with an amazing group of people I tend to be quiet and focus on that special stone in my backpack. This climb was no different so trying to come up with Tyler’s story and how I could summarize his short life was my ultimate goal. No matter what comes out of my mouth when we all hit the summit and talk about our heros I can never seem to do it justice. I always feel like I have it down and then I begin to talk and out comes something I never thought of saying. Tyler was a good kid to grow up with. His family, which was the most important thing in his life, were, and continue to be, a strong and connected family. We would all be so lucky to have them in our lives as loved ones. I think this was something Tyler never took for granted. When things were tough he stayed centered around his family and found strength within that circle. I noticed as we all began to talk about our heros there seemed to be a common denominator with them all, FAMILY. I think life can be cruel and filled with chaos if you let it. Sometimes it’s hard to see good in the face of tragedy. The “good” that comes from Tyler’s story is as large as it is sad. Throughout Tyler’s struggles with PTSD he always fell back to his comforts, his family. Tyler’s mom, Joyce, told me that in the months before he died, she would often find him inside his garage, wanting to be alone yet still being close to her. She said he would try hard to be connected with his nieces and nephews, his little sister, and his older siblings, even though staying connected grew harder for him. The thought of anyone struggling with PTSD is a hard concept for me, I have a great life and an amazing family who bring so much joy and happiness in my life. I can only assume that same feeling is what Tyler felt for the ones he was lucky enough to call his family. He was a great kid to have called a friend and his story will live on forever within his TSP family. This truly was an honor and privilege to carry the stone and story of such a strong leader and family man. On October 28th, Cub Scout Pack 874 of Standish, Maine participated in a hike on Black Cap Mountain. Our mission was to teach these boys about the honor and sacrifices that young men, like your son, made to help protect their rights and freedom. The boys undertook this project with seriousness and poise that shows their appreciation for all the men and women who serve our country. Having never met Tyler, the stories shared by his family led me to understand who he was as a child and young man. Tyler’s youth sounds like an amazing adventure. Just enough mischief to keep things lively for his family and friends! His heart, so large, that he was dedicated to supporting his immediate family and serving as a mentor to his nieces and nephews. What a man to have lived such a life. It is a testament to his family, his upbringing and those that he surrounded himself with. Truly, a hero at home and abroad. Thank you for allowing me to learn about Tyler and in turn letting me share his story of living life to its best. It was an honor to carry his stone and think about what he gave of himself to make this world a better place for all those folks he loved. His story is one that I will carry with me. I was very touched and very moved by the story of your son. I had the honor and privilege this last weekend to run in the Millinocket marathon while carrying your son stone. I do believe all veterans have some sort of PTSD. Some are worse than others but no matter how little or how much each veteran suffers we all need to get together and find help for that individual to the best that we possibly can. The more I read through what you wrote about your son the more I saw my self. We had a lot of the same interest from being outside to loving football. I want to thank you for sharing the story of your son and hopefully in the near future we will be able to meet and I will be able to thank you in person you and your family will be in my thoughts and my prayers for your son and I will continue to educate people not only on PTSD but how your son was a hero to you and a hero to all of us. Hello, my name is Hunter Lovering. I’m a sophomore at Nokomis Regional High School. It was a great honor to carry SGT Tyler Ray Curtis’s stone. I hiked Tumbledown Mountain in Weld Maine as part of the Summit project on June 8, 2018 with my JROTC peers. Like Tyler, I enjoy the outdoors, so it meant a lot to make the hike the best it could be. As I got tired on the way up I thought to myself “yeah I’m tired but this isn’t about me it’s about honoring Tyler as the great man that he is. Every time I needed energy, just thinking about how important Tyler was and what this meant, I kept pushing myself to get to the top. I picked Tylers stone because he enjoys the some of the same stuff I do and I felt close to Tyler. As we got to the Summit i knew what I was going to say about Tyler and how great of a person he was. I talked about how he loved the outdoors and was always caring about his family. Tyler enjoyed everything thing about Curtis camp and his rock looked amazing. It’s awesome you found his rock around his favorite spot. The Summit project is a great way to honor the men and women that served and died for our freedom. I believe everyone should take the opportunity to honor one of the fallen Mainers, that have died in the state’s and overseas. I’m really honored to say I carried Tyler R Curtis’s stone. I thank Tyler for his 5 years of serves in the United States Army. Thank you for everything you did and your two tours in Iraq. Rest in peace Tyler, you will always be remembered. Tyler, I had the opportunity to carry you up Cadillac Mountain at this years ANP event. I spent the weeks before researching you, emotionally investing in you. I took time to enjoy the things that were important to you . I hiked a Suicide Awareness Walk, watched football, spent time with family and spent more time with my dogs. Although my time spent with you seemed so much more than just “time” with you. It helped shaped me into what I felt would be the beginning of a lifelong friendship with TSP. Through you I’ve formed friendships that I otherwise wouldn’t have. Being a Gold Star Sister myself I know how important these connections are. I can’t thank you enough for not only your service, that of course goes without saying. But for reminding me what’s important in this life. Family. I couldn’t have been more proud to speak of you in the sacred circle. I touched on your struggles and hardships near the end of your time here. However, I emphasized that how you left is not what defines you. I made sure to press upon everyone how you felt the importance of family shouldn’t be understated. I spoke of your passions and hobbies. I could have gone on all day. What I was not prepared for was handing you back over. I selfishly did not want to let you go. I cried as I walked to the center because it was like saying goodbye to you again. I had comfort in knowing I was handing you to an Army Veteran, my boyfriend. Nobody saw me as I snuck a moment afterwards to go see your stone on the table. I just wanted one more moment with you. But what I’ll take away from that moment is that you’ll always be with me. I’ll enjoy sharing your story over and over. You’ve forever changed me for the better and I thank you for that. I think next time I’ll be more prepared for that closing ceremony. But for that moment on the 29th, I just wasn’t ready.